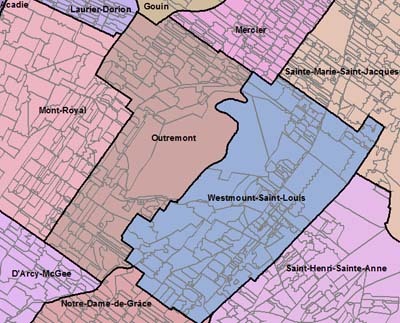 Quebec Electoral Map produced by Directeur général des élections du Québec, contains maps in digital form of provincial electoral district boundaries and polling divisions. The electoral map that is available delinates the 2001, 125 seat representation, that is currently in effect. This data is available in ESRI Shape format and can be used in a Geographic Information System. Documentation The Quebec Electoral Map Data Dictionary contains a detailed description of the attributes. At present, this is only available in French. Citation Quebec Electoral Map [computer file] Quebec Electoral Map. Quebec: Directeur général des élections du Québec, 2001.